We move back to Drama in the Great Movies – 100 Years of Film book, and take a look at Martin Scorsese’s biopic on boxing legend Jake La Motta, brought to visceral life by an Oscar wining performance by Robert De Niro. As succesful as La Motta would prove to be inside the boxing ring, his violent and jealous streak would cause him nothing but pain outside of it. The film opens in 1964 with an aging, and heavier (DeNiro gained 60lbs from his lean, middleweight fitting look in the film), La Motta in his club, where he regales his clientele with jokes and stories of the ring. We flash back to the 1940s and see La Motta as an up-and-coming boxer, hopefully on a run for the title, with his brother, Joe (Joe Pesci), serving as his manager and trainer. He’s married, but is more than happy to fool around on the side, until he meets the young, vivacious, Vickie (Cathy Moriarty). But even that bliss will be interrupted by his volatile nature, even as he closes in on the title he so desperately wants. 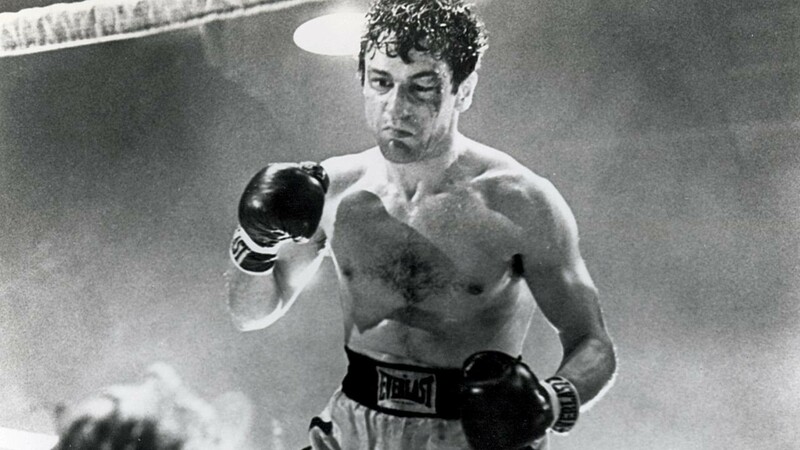 Shot in black and white (bur for some sequences featuring La Motta home movies), partly to differentiate it from Rocky, the film has a gritty, documentary feel to it, and DeNiro is simply electric. The boxing sequences are rough, brutal, superbly choreographed and stunning to watch, and DeNiro, is completely believable as La Motta. But things begin to unravel for La Motta, and he takes it out on everyone around him, hurling accusations and physical abuse at anyone and everyone who is close to him, driving away Vicki, his children, and his brother. It’s a brutal story, stark in its honesty, the documentary feel of the black and white film adding to that sensation and the performance by De Niro is just incredible, and shows his commitment to the craft (apparently Scorsese was worried about how much weight his actor had put on for La Motta’s early years, and it is a shock to see, after how lean and fit he looks as La Motta in his heyday). While the emotional story is the core of the film, it’s the boxing sequences that captivated the attention. Just the choreography for them, the training, and look of them, all of it is just stunning to see on the big screen. I highly enjoyed this one, and am even now, settling in for some of the recommendations spilling from this one, a number of sports titles (kind of), and some of the them are going to be a lot of fun to see again. What’s your favorite sport movie?